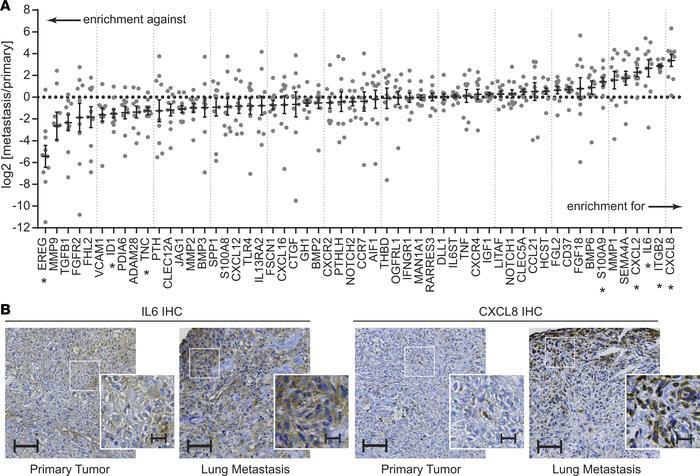 Candidate gene enrichment in primary tumor–lung metastasis pairs from patients with osteosarcoma. (A) Gene expression for each of the 56 candidate genes was assessed in primary tumor–lung metastasis pairs using singleplex qPCR assays validated across multiple FFPE tissues. Expression within each lung metastasis sample was normalized to expression within the primary tissue, then log transformed. n = 10 sample pairs. Single-sample t tests against a theoretical mean of 0 (for normalization to primary tissue) were evaluated, controlling for a false discovery rate of 0.05 using the Benjamini-Hochberg method. *Denotes candidate genes whose expression is significantly different between primary tumors and metastases. (B) Representative IHC sections from 1 primary tumor–lung metastasis pair showing changes in the staining intensity and staining patterns from primary to metastasis. Scale bars: 100 μm and 25 μm (insets). Additional examples are shown in Supplemental Figure 2.